This is the third time that the entire coastal area including, Yeroskipou, Paphos, Kissonerga, Chlorakas, Peyia, Polis Chrysochous and Neo Chorio has achieved Quality Coast status, the first win was in 2013. “Following the recent award of 17 Blue Flags across the district, Paphos has now been honoured and managed to win the Gold Quality Award as a Sustainable Coastal Tourism Destination for 2017,” Nasos Hadjigeorgiou, the head of the Paphos regional board of tourism, told the Cyprus Mail. Three new beaches in the Paphos district were awarded blue flags this year; Neo Chorio, Peyia and Yeroskipou. Hadjigeorgiou said that the achievement has been a concerted effort of the bodies involved. The prestigious award is given out to holiday destinations that best maintain their local identity, natural and cultural heritage, scenic beauty, and a clean environment. 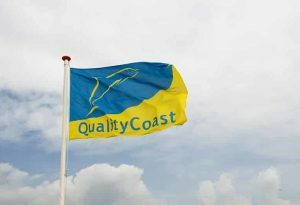 Quality Coast Awards will be presented to winning destinations. “The distinction has been made possible by the cooperation of all of the Paphos municipalities and communities of the region, under the coordination of the Paphos regional board of tourism who also made the submission made for the region,” he said. Hadjigeorgiou said that the awards recognise areas that they are clean and safe with great facilities. The tourism head said that the entire coastline of Paphos has been recognised as most attractive for visitors who want to combine holidays with an enjoyment of nature at a destination with enchanting scenery that cares for and preserves the quality of the environment and practices to protect and enhance the local identity and cultural heritage. Quality Coast is the largest international certification programme for sustainable tourism destinations. Since 2007, more than 125 tourist destinations in 23 countries have been selected for awards, including coastal towns, resorts and islands. As from 2013, destinations from all the world can apply for a Quality Coast Award, giving it even more global recognition. Hadjigeorgiou said that the district of Paphos is already well known all over the world for its beautiful nature, clean beaches and crystal-clear waters. He noted that the Gold Award will give more kudos and ensure that the districts’ international reputation will continue to grow. The main criteria for the selection of areas are water cleanliness, biodiversity of areas, environment, active good environmental behaviour, such as the saving of natural resources, socio-economic status, cultural heritage, lack of air pollution, noise levels, quality of tourism infrastructure, security, accessibility, easy access to information, and so on.